Seriously debated sharing this but I decided to let my pain perhaps serve as a safety reminder for others. Please keep the negative comments to yourself (I am well aware of how stupid this was) and let this just serve as a safety reminder. Copied from a local forum so I'll explain the location a little. We take a 2 mile boat ride to a dike crossing, and the go another mile from there. Crappy way to end a season. Started out as a beautiful morning at the Bear River refuge with my son and brother-in-law. Had 5 ducks down despite an iced-over pond, the first being the most gogeous drake pintail I have shot in years.Had a nice greenhead sail out on us and during a break I decided to walk back to the boat and run out and pick it up( it had sailed about 200 yards before dropping straight out and the dog was having a tough time in the ice). My brother in laws dog decided to join me on the walk to the boat. I did the same thing I always do when it is just me going after a downed bird in the boat. I set my double barrel in the decoy box, walked around the front of the boat to get a better angle to push it out of the weeds and just as I had turned to cross the front of the boat and ( in case you haven't guessed) Boom, the gun goes off. I looked back and the dog had climbed over the side and stepped on the trigger. About a half second later I realized I had been shot. I fell down backwards in the water, just from the shock. Got up, called my in-laws because I knew I was gonna need a ride out and didn't to wait for the 3 mile boat ride back to the truck. I gathered my senses as much as possible and realized I had quite a bit of moisture down my legs and was starting to feel faint. I decided a 911 was probably in order. Try explaing to the dispatch how to find you at the winch pole dike crossing while passing out and boating through an inch of ice(lots of noise). Finally made it to the crossing and by Gods graces there was another boat just pulling up in the channel. They gave me a ride across the channel just as the ambulance pulled up. A number of things happen to us physically as we age, and I have not as yet been able to identify any that are good. A couple things that change, as you may have noticed if you are on the sundown side of your mid-fifties, is your joints don’t operate with the fluidity and efficiency as once they did when you sent the hearts of twenty-something lasses all aflutter with but a glance. You'll be able to identify the onset of this particular malady because it chronologically coincides with an involuntary groan when you get up from your favorite chair after watching re-runs of NCIS. Another thing that happens later on is... you get shorter. You're going to get shorter if you haven't already. Thanks to gravity, compaction of cartilage, especially those discs in your spinal column, can rob you of up to several inches from the height you were at 25. And trust me on this – you aren't going to shed pounds to keep your Body Mass Index where it was back then, either. If you were six feet and 175 in your 20s, you'll possibly be five-nine - and 175 - in your 60s. Maybe more as metabolism slows and appetite doesn’t. 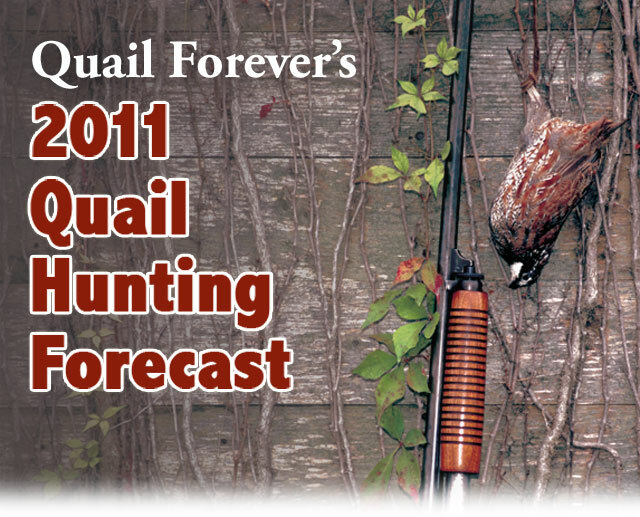 A combination of unfavorable conditions, from drought in the south to hard winters further north, and continued habitat loss will make the 2011-2012 quail hunting season tough on hunters. On top of the drought in Texas to the hard winter in Iowa, there are 5 million fewer Conservation Reserve Program (CRP) acres – many of which acted as quail habitat - than there were just four years ago. Quail Forever is advocating for a strengthened CRP and other federal conservation programs in preparation of the upcoming Farm Bill, but we cannot do it without your support as a Quail Forever member. As a member of Quail Forever, I believe in conserving wildlife and protecting the environment. I promise to leave the outdoors a little better than I found it. I will hunt safely and treat hunting on public and private land as a privilege. I will always ask permission before hunting private land. I will obey all game laws and insist my companions do as well. I've started the last few pheasant seasons by hunting in the Hutchinson, MN area and have had good luck so I decided to go with what had been working. Our friend Greg and is GSP, Tank, joined us on the hunt. Our first stop was a farm just west of Hutchinson. The corn was still up along two sides of the field. We started out by following the edges of the field in hopes of cutting off any birds that might be trying to make it to the corn. The dogs did get birdy along and in the corn but we didn't move any birds. Next we moved towards some trees on the way to the drainage ditch that cuts through the unit. The dogs didn't get too excited in any of these areas. We decided to change it up and cut across the field and the dogs started to get more interested. Tina pointed and relocated a few times before locking up solidly. I moved in and the birds came up. Six hens ended up flushing. They looked really small so I am guessing late hatch or a renest. we continued to work the field back to truck and didn't move any other birds. We then moved to another farm. This farm is just south of Hutchinson. We started by working the edge of the cattails. The dogs were worked all the way to the other side of the wetland and started the point and go, point and go that signals a bird nearby. I took a step to the right and a rooster got up. I totally blew the opportunity. I was hunting with my Browning Over / Under and flipped the selective trigger to the side instead of forwards to release the safety. By the time I recovered the bird was out of range. I was pissed at myself. I have been mostly hunting with my Beretta semi-autos this fall and wasn't able to make the adjustment. arrgg. After recovering from being ticked at myself we made a swing towards the south edge of the field. As we pushed through the trees that line the border of the field the dogs started to get more active. Tina went on a solid point. I hoped to redeem myself and moved ready for the bird. Up came a huge Tom Turkey. It was a shot that I'm sure that even I could have connected on. Not having a turkey tag and using dogs on turkeys being illegal I passed on the shot. At the edge of the field we made a move towards some thicker cover. As we approached the cover we had a rooster bust out well past gun range. The dogs continued to work well but it was warming up to the mid 50's and the wind was picking up as well. We decided to call it a day. With moving so few birds the easy missed opportunity stings all the more. The vet pulled this thorn from Marge's eye this morning. 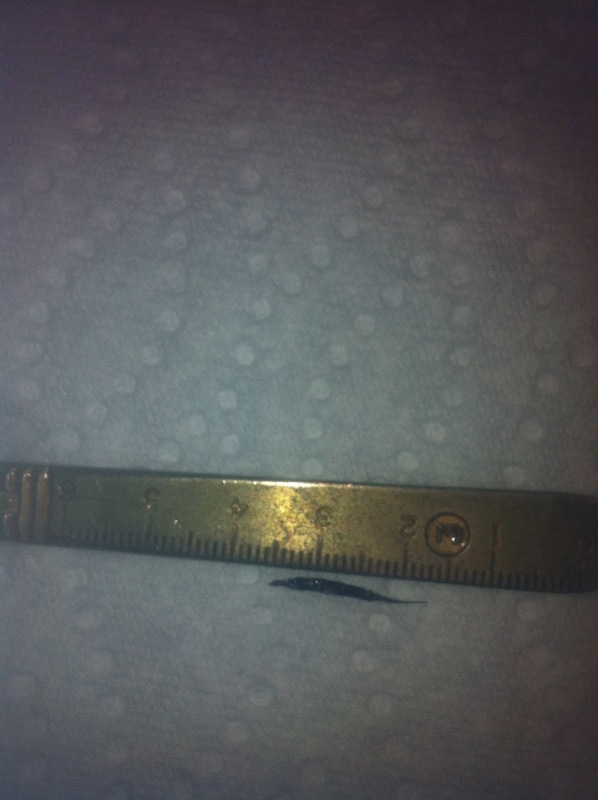 She had been rubbing it since Wednesday morning and today was the earliest I could get her in. He said he didn't think it caused any permanent damage. I looked and looked but couldn't see anything in there. Shoreview North Oaks Animal Hospital has done good work for us in the past. A friend of mine once accused me of having a Texas-quail-low-humidity-over-setters-on-Friday-afternoons shotgun, his point being that I maybe had gone a little overboard over the years accumulating shotguns for special purposes. I don’t have a gun like that, of course. I sold it, selling or trading shotguns being the best way I know of to buy other shotguns. Besides, I had no way of knowing if I’d even be hunting on any Fridays. But, you know, I wouldn’t play golf with one club (even though you can’t call what I do, strictly speaking, golf) because my driver can’t do what my pitching wedge does and vice versa, and I can’t expect my Michigan brush-country woodcock gun to be of much use on late season South Dakota pheasants. And vice versa. As the title more than implies, I’m going to talk about prairie shotguns, those guns used in the Big Open for birds other than pheasants, mainly Huns, sharptails, and prairie chickens. These are birds and it’s a place that calls for some specialization. Let’s take the birds first. Huns can be tough to kill at times, especially late in the season when, as Ben Williams says, the September Squeakers have turned into November Rockets. I don’t mean because of the distance of the shots they offer as the season progresses, though that’s a major factor. I mean the birds need to be hit solidly. Sharptails and chickens, on the other hand, don’t have to be hit with a hammer to bring them down – a few shot of moderate size will usually do it. But that is where range comes in. 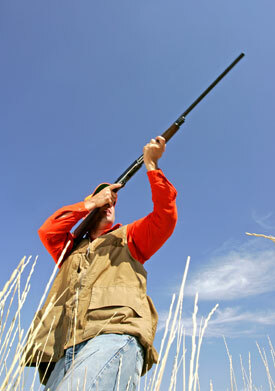 Traveling Wingshooter's 2011 Pheasant forecast for the state of SD, KS, ND, NE, IA, and MN. 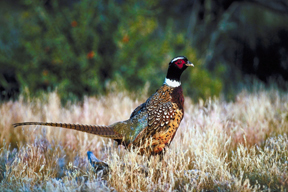 An extremely harsh winter across the heart of the pheasant range in the Midwest – the last in a string of bad winters in some states – plus a wet spring in the Dakotas and Minnesota, and the continued loss of Conservation Reserve Program (CRP) acres, all combine to mean tougher prospects for ringneck hunters in the traditional top states. After the better part of a decade of fantastic pheasant numbers in the Midwest – bird numbers aided by a strong Conservation Reserve Program (CRP) – pheasant hunters will be finding fewer ringnecks during the 2011-2012 pheasant hunting season. Tough weather, from drought in Kansas to hard winters in the Dakotas, did its fair share to hurt pheasant populations, but it’s the 5 million fewer CRP acres than there was just four years ago that made sure pheasant numbers were bound to decrease, which they did in every major pheasant producing state. 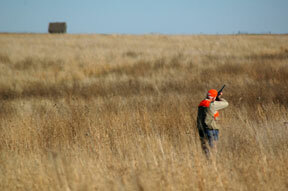 Pheasants Forever is advocating for a strengthened CRP and other federal conservation programs in preparation of the upcoming Farm Bill, but cannot do it without your support as a Pheasants Forever member.